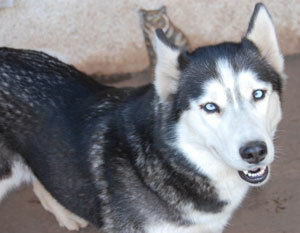 Nala is a 4 1/2 year old female Siberian with baby blue eyes and just full of love. She is happiest when she is curled up near you or even better ~ right next to you! Nala loves to cuddle with her people and her “sister” Skye. Nala and Skye came in to our rescue together when they were found running loose. Sadly, nobody came forward for these great Siberians and we welcomed the girls in and we are thoroughly enjoying them. They are very affectionate and love to share an open crate to nap in. They are great with the other dogs and visitors fall in love with them. Skye and Nala are housebroken and trustworthy in the house as long as you are willing to share the couch and your lap with them! These sisters are a bonded pair who love and depend on each other. We simply cannot separate them and they will go to a lucky home together ~ double the fun! If you are looking for two wonderful huskies full of love, please ask us more about Nala and Skye.